Dr. Mansukh C. Wani is a co-discoverer of the anti-cancer agents Taxol® and Camptothecin that have saved millions of lives. In 2002, 33% of the total anti-cancer drug market (nearly 3 billion dollars revenue) was due to from these 2 agents or its analogs. 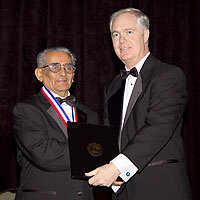 Dr. Wani is recipient of many awards, including Bruce F. Cain Memorial award from American Association for Cancer Research, Charles F. Kettering Prize from General Motors Cancer Research Foundation (considered as Nobel Prize of cancer research). In 2003, American Chemical Society designated the discovery of Camptothecin and Taxol® at the Research Triangle Institute a National Historic Chemical Landmark. Dr. Wani is a very humble individual and a great scientist. ApnaTriangle is honored to sit with him and discuss his exhilarating journey. Satish: Please tell us about when did you come to US and how were those days? Dr. Wani: I grew up in Nandurbar, Maharastra. I received my master’s degree in Organic Chemistry from University of Bombay in 1950. I came to US in 1958 as a Research Fellow. At that time, there were about 25 Indian students studying at Indiana University. We had fun time together. I obtained a PhD degree in Chemistry from the Indiana University in 1962 and was offered a job at RTI. Even though my American friends warned me about racial discrimination in the south, I accepted the offer and joined RTI as a Scientist. In 1962, there were about 75 Indians living in the Triangle area and there were no Indian grocery stores. Any Indian visiting New York would buy groceries for many other Indians in the Triangle area. Times have changed. In 60’s, Indian students had difficulty getting a house for rent. Owners were afraid that whole house would smell of curry and the house value will go down. Today, Americans love Indian food and swarm Indian restaurants. Satish: What was the driver for joining RTI? How did you get involved with Cancer Research? Dr. Wani: My passion was to do research in Medicinal Chemistry. Initially, I came to RTI to work for Dr. Sam Levine. I had the expertise and techniques to work with sensitive compounds available in very small quantities. In mid 1963, Dr. Monroe E Wall learned about my skills and influenced me to join his group to characterize the then recently isolated anti-cancer agent Camptothecin. Within 3 months of joining Dr. Wall’s team, I succeeded in identifying the structure of Camptothecin. Dr. Wall was extremely impressed with my work and I got into the field of natural products research. Satish: Please tell us about the steps involved in isolating a compound from natural material suitable for cancer treatments. Dr. Wani: Raw material is collected from natural sources and the individual compounds are isolated by using extensive fractionation. The isolated compounds are evaluated for anti-cancer activities. The chemical structure is identified and the mechanism of action to treat the cancer is determined. It is then used to treat human cancer tumors implanted in mice. The drug then goes through extensive animal toxicity studies and 3 levels (Phase I, II, & III) of clinical trials on humans before seeking approval by FDA. It is a very lengthy process. Interest in natural products research to treat diseases keeps swinging back and forth. There was huge research going on in 1980s. 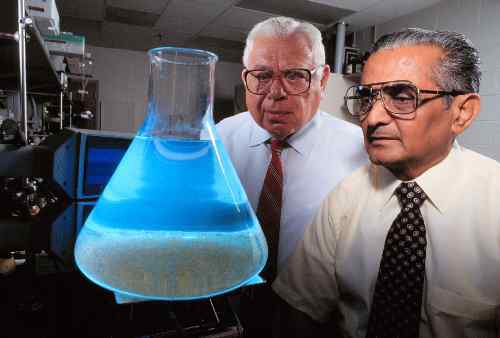 Then in 90’s the research was moved to making drugs from combination of compounds (combinatorial chemistry). There is now revival of interest in natural products. Only time will tell that natural products research is an endless frontier or end of an era. Satish: Camptothecin was discovered first. Please tell us more about it. Dr. Wani: We published the structure of Camptothecin in 1966. There was lot of excitement in the scientific community all over the world. The scientists started finding ways to produce this material in the lab (total synthesis). Clinical trials began in 1970. We then had a major setback. Charles Moertel, a famous oncologist at Mayo clinic, had done clinical trials. In a scientific society meeting in 1971, he declared that “I have come here not to praise Camptothecin, but to bury it. It is very toxic and has no clinical value in treating cancer”. In 1984, Leroy Liu found that Camptothecin kills the cancer cells by a very unique mechanism of action. Then, NCI and many pharmaceutical companies all over the world got excited and moved forward with the development of Camptothecin. Today, two analogs of Camptothecin are clinically approved and used extensively in the treatment of Cancer. Satish: Taxol® was discovered next. Please tell us more about it. Dr. Wani: Taxol® story is very fascinating. We started working on it in 1966 when the bark of the pacific yew tree came to us from NCI. It took about a year to separate the compound which showed promising activity for cancer treatment. We gave it the name Taxol®. Determining the Taxol structure was extremely challenging. Advanced Instruments and techniques were not available in those times. We had worked on determining the structure for about 2 years without success. One day, Dr. Wall called me to his office and asked me to forget about Taxol. I asked him whether I could work on it during my spare time. He agreed and I kept on working on Taxol as a low priority. I persisted on determining the structure of Taxol by working on it during evenings and weekends. Taxol was shelved for a while due to its complex structure and limited availability in nature. Matthew Suffness played an important role in the development of Taxol as an anti-cancer agent. He helped others to see the potential of Taxol in treating solid tumors and he was a strong advocate of Taxol. In 1979, Susan B Horwitz discovered Taxol’s unique way of treating cancer which gave a significant boost to development of Taxol. The pre-clinical studies began in 1977 by administering Taxol to mice. Taxol turned out to be very effective in treating cancer in mice. In 1984, clinical trials in human patients were started. In phase I clinical trial, patients who are terminally ill are chosen. Some patients had allergic reaction and one patient had severe allergic reaction and died due to heart-attack. One of the members of the Taxol team of doctor said “Taxol is a useless drug; it has no clinical value what so ever. It is highly toxic and does not have any potential to cure cancer”. However, Dr. Peter Wiernik, a member of the team came to our rescue. He felt that toxicity could be due to the solvent and not Taxol itself. He suggested pre-medicating the patients with anti-histamine, anti-acid and a steriod before administering Taxol. Following this pre-treatment, the results were amazing in treating cancer. Satish: You are 84 years old, what drives you to continue working? Dr. Wani: Two things drive me to continue working. A few years ago when I discussed about my retirement with my long time colleague Dr. Wall, he scolded me and said there is a lot that still needs to be done. Dr. Wall continued to work until he passed away in 2002. He was a great friend and a great motivator for me. Second is my passion. For example, recently in our lab a water soluble Camptothecin with defined activity against pancreatic cancer has been identified. This is very encouraging and these challenges keep me going. Satish: What are the other things that you have worked on? Dr. Wani: I have worked on compounds to treat sickle cell anemia, malaria, and contraceptives. Some of these compounds have been licensed to private companies for further development of drugs. Satish: Do you have any regrets that you did not research these compounds in India? Dr. Wani: Absolutely no, I do not have any regrets. If these compounds were discovered in India or for that matter in any other country, these compounds would not have become drugs. These compounds would have died a dusty death on my laboratory shelf. Only in this country this can happen. Millions of dollars were spent, many individuals worked hard and lots of risks were taken to transform these discoveries into life saving drugs. Satish: Please tell us about your family and the support from them. Dr. Wani: My wife has provided a major support and sacrificed a lot. In 1958, my wife and my son stayed back in India for 2 years while I was doing my PhD. During my research, I used to spend long hours in the lab. I was in the lab even on weekends and holidays. I would even write vacation on timesheet and work here in the lab. She understood my commitment to research and provided a great support. My father was a victim of the great depression of 1930s. My brother dropped out of school to support the family and to keep me in school. He sacrificed a lot so that I could finish my master’s degree. Satish: What advice would you give to new scientist? Dr. Wani: Choose something that you love to do, keep pursing your dreams and be very persistent. I chose to be a Medicinal Chemist. I faced major challenges. I went back to school (PhD) after working for 8 years. I had to leave my family behind in India. We had major setbacks with Taxol and Camptothecin. I could overcome all those because of my passion and staying the course to pursue my dreams. Don’t give up and don’t be dogmatic about things. As mentioned earlier, a Mayo clinic doctor said in a scientific society meeting, “Camptothecin has no clinical value. I am here not to praise it, but to bury it”. One shouldn’t be dogmatic because the same society recognized us for the same work with the prestigious Bruce F Cain memorial award in 1994. Today Camptothecin analogs save millions of lives. So, my advice is - “don’t give up something that you strongly believe in”. These apply to all endeavors of life. Dr. Wani: Statistically, one out of five thousand compounds with initial promise goes on to become a clinically approved drug and of these 3 in 10 never payback the development cost. I have been recognized as a co-discoverer of not one but two life saving block buster drugs. I get hundreds of letters and email thanking me for saving life. It has been an extremely fulfilling and satisfying journey. Dr. Wani is a very humble and down to earth person. He works as Emeritus Scientist at RTI. He continues to pursue his passion. He lives in Durham with his wife Ramila. Dr. Wani has published more than 250 research papers ranging from anticancer agents to anti-fertility agents. Dr. Wani holds more than 25 patents.